Serving Lunch Wed-Sat 11-3:00 & weekend Chef’s Dinners by reservation, details on the Events Calendar page. Now open, A Chef's Kitchen Market right next door with wine, beer, provisions, and packaged food to-go. Open 12-6:00 Wed, Thur, Sat; 12-7:00 Friday. For information about The Supper Club @ Habersham Marketplace, click here. 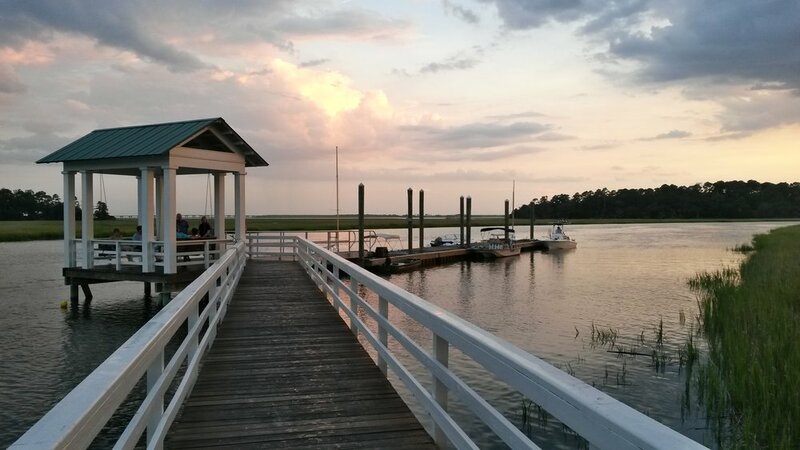 10 Market is located in the beautiful waterfront community of Habersham, moments from historic Beaufort, South Carolina. We serve lunch and host challenging culinary classes along with weekly tapas bar and chef's dinners several times a week. Dinner seating is limited to 10 guests to ensure an intimate and interactive experience with Chef Tyler Slade. Join us for afternoon wine on the patio or browse our Market’s shelves for the building blocks of Tyler's culinary magic. Tyler crafts fresh, European style panini (served with his signature gourmet popcorn) as well as home made soups and seasonal salads. Take Out is always available or enjoy our offerings at the counter or the patio. Demonstration and hands-on classes are offered for both adults and kids and attendance is limited to 9 participants. Classes are posted and described on our events calendar. A Chef’s Kitchen Market is now open next door to 10 Market. Open Wednesday, Thursday, Saturday 12 - 6:00 pm; Fridays 12 - 7:00 pm. Offering fresh bread, wine, beer, Boars Head meats & cheeses, food to-go, and provisions. We love Habersham and are excited to contribute to its special sense of community. Join us for a bite to eat and then stroll our beautiful neighborhood. Have a seat by the marsh or watch the wildlife. We are always looking for ways to improve our offerings and keep our friends and guests coming back. Feel free to give us feedback and suggestions for classes, menus, or products you would like us to carry in the Market. Habersham is on the Broad River, just minutes from historic downtown Beaufort, SC.